I’ve been updating little blurbs here and there on Nora’s Facebook page: Praying for Nora Rose Yusko. It’s just much easier to update there. Currently Nora is in CICU at Children’s Hospital with her heart rate elevated up into the 200s and a fever of 105.3°. She was admitted on Monday with congestion on her lungs and terrible upper respiratory junk. She had a few mild fevers, but nothing like this. Monday she tested positive for RSV and another virus called hMPV, as well as some suspected bacterial pneumonia. The pneumonia is being treated with ampicillin through an IV, the other stuff just has to run its course as it is viral. Nora had been doing well, had been eating GREAT – we even got a couple of smiles here and there. For some reason, yet undetermined, she spiked the highest fever she’s ever been known to have just this morning around 6 am. The fever has brought her heart rate through the roof. 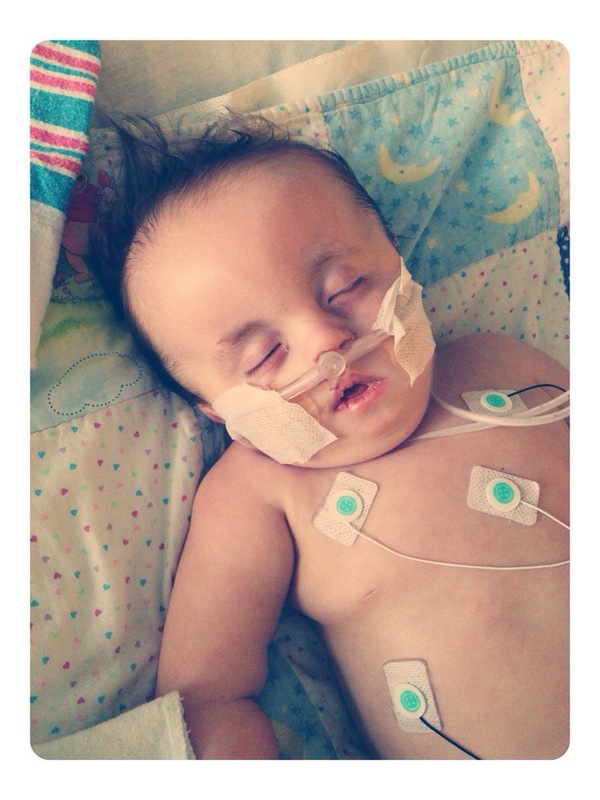 The RSV, hMPV do not typically bring about a high fever like this. More labs have been drawn to check for any other infections. Her chest X-Ray is looking a little worse and she is now on high flow 5 liters of oxygen. We are hanging out here in the CICU so they can keep an extra close eye on her. They’ve put something in her nose (trumpet) to assist with suctioning as her little nose was getting pretty agitated. She’s resting peacefully right now. Fever is down to 102.2° and heart rate in 170s. Thank You, God!!! We appreciate each and every one of your prayers. I am so comforted by all of your messages, texts and emails. I obviously can’t respond to them right now, but I am reading them when I can. Two people have written to me about dreams they had of Nora in the past couple of nights. In both dreams she was older and talking, very happy. Neither of these people know each other, one has never met Nora (or me) in person YET. I take these very seriously as God-sent messages. Remember Greta’s dream in which He LOUDLY spoke to us with that beautiful glimpse into the future!!!!!!! As always– SPOT. ON. Wow…. Praise Our LORD!!! Love and prayers always from MANY!! I know you know this!! Just have to keep telling you! Holding you all so CLOSE AND TIGHT in my HEART!!! Praying so hard for Nora Rose and the family. Our God is a good God. I know he will watch over you all. Praying very hard for all of you. My daughter is a nurse at Children’s Hospital on the 7th floor and she works today from 3-11 pm and has also been praying for Nora. She said she will pray very hard while at work and closer to her and bring all of our good wishes right to the hospital! Please take care of yourself as well! I actually saw you at the doctor’s office on Monday AM. I was waiting to take my little girl back. I was going to say hello but you got called back while I was still talking to the receptionist. I was hoping everything was ok. Prayers for little Nora and your family. Lifting Miss. Nora and your family up in prayer!! So happy to hear that Nora is doing better! Keeping Nora and your family in continued prayers! It breaks my heart to see this. I’ve been reading your blog since before Nora was born and feel like I know your family. My 7 week old daughter was hospitalized most of last week with RSV. I’m praying for Nora and your family. I hope the nurses are taking just as good care of you as they are Nora! I don’t feel a desperate feeling. Or that I need to say “I hope” she pulls through this. There is such a peace and calm in my heart and spirit. Since the moment of her conception, our God has had His Hand on sweet Baby Girl! He has Carried her, as you carried her, through many moments of fear and doubt. And, He will continue to carry her! And, You, Aleisa. She looks so peaceful in her sleep. You’re her Mama, so I know you worry. It’s normal to feel fear, especially when you feel her hot little body or watch her heart rate go up on the monitor. So, while my prayers are most definitely for continued healing in Nornor, I want you to know that I am also praying for her Mama and Daddy. For all of her family. For Peace. For rest. For a strength that you are not even aware exist in you. Keeping you all in my prayers and send much love!!!! Praying for Nora’s health and the peace of Christ for you and your family. I will pray for Nora. I’m sorry she is sick. Dreams can definitely be a message from God. A friend of mine had a miscarriage and a few months later I had a dream where she had another child. She delivered a healthy baby who is now 3 years old. I know God sent that message to me in my sleep. I hope Nora will live a long heathy life despite her disability. Nora will always have health issues but she can still have a pretty heathy happy life. Lots of prayers for you all in these days. God be with you and sweet Nora and being her quick healing.